Sacred Heart guard Erin Storck is averaging 10.6 points for the Pioneers. 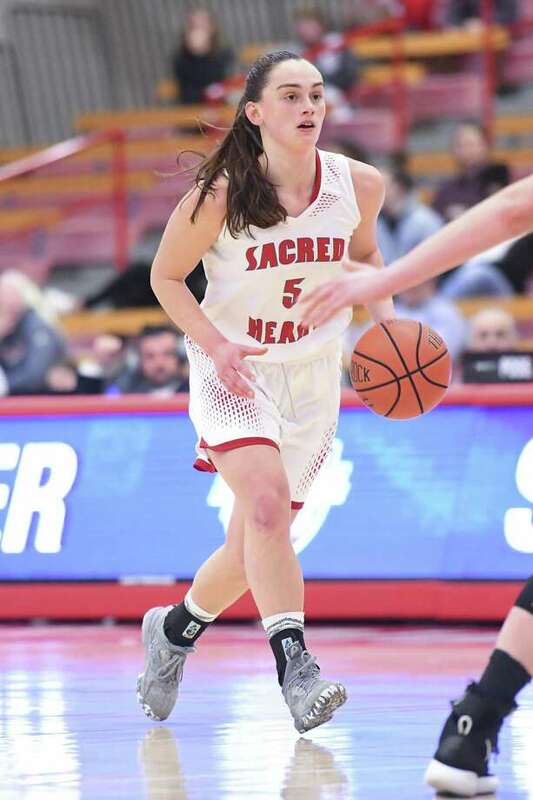 FAIRFIELD — A loss in the NEC semifinals was disappointing for the Sacred Heart women’s basketball team, sure, but the disappointment only goes so far. The Pioneers liked their effort, and they have another game Friday. The Pioneers make their eighth postseason appearance in Division I on Friday, visiting Georgetown at 7 p.m. in the first round of the WNIT. They’re seeking their first win. They’ve had a 19-12 regular-season, including 14-4 in the NEC. They led St. Francis (Pa.) in the conference semifinals early, but their shooting went cold in a 68-60 loss. They aren’t dwelling on that. The Pioneers have five seniors and some young players who’ve made strides. They’ve got four players who were honored on NEC’s postseason all-star teams, including first-teamer Katherine Haines, who posted the program’s first triple-double on Jan. 19 at St. Francis (Brooklyn) — 25 points, 15 rebounds and 11 blocks. ABOUT THE PIONEERS: Sacred Heart makes its eighth Division I national postseason tournament appearance (fourth in the WNIT) but is looking for its first win. ... The Pioneers had won six in a row and nine of 10 before a 68-60 NEC-semifinal loss to St. Francis (Pa.). ... Graduate-student F Katherine Haines (16.8 points per game, 9.0 rebounds per game) was named first-team All-NEC. Three others earned postseason all-conference honors. ABOUT THE HOYAS: Georgetown had won five in a row before falling to Marquette 75-62 in the Big East semifinals. The Hoyas have won six in a row at home. ... Sr. G Dionna White (16.4 points per game) was named first-team All-Big East. Her 349 steals are a program record. ... Georgetown is 3-0 all-time against Sacred Heart, though the schools haven’t met since Nov. 9, 2012. UP NEXT: The winner plays the winner of Friday’s Harvard-Drexel game, site and time to be announced. “When we are in a good rhythm, playing inside-out — obviously, we have a first-team all-conference post player; she’s dynamite, gets it done for us every night — the reason she’s so successful is because our guards have done a tremendous job being guards,” Pioneers coach Jessica Mannetti said. Georgetown, Sacred Heart knows, will be a challenge, a Big East school with top-flight guards, like Dionna White, a senior who set the school record for steals, and Dorothy Adomako, who averaged 16.5 points. Storck said she loves the chance to play big-name programs. The Pioneers have experience playing against one this year: They visited Kentucky, ranked 18th at the time, on Dec. 29. The Wildcats won 71-43, but it’s not like going into McDonough Arena on Friday will be the most intimidating thing the Pioneers have ever done. There’s a neat local side connection to the matchup: Georgetown sophomore guard Lexi Kimball of Westport is the all-time leading scorer at Greens Farms Academy, where Mannetti coached before going to Hofstra as an assistant, her last stop before joining the Pioneers.